With bright colors and eye-catching patterns, Premium Grade Koi are perfect for those customers with a trained eye and high expectations. 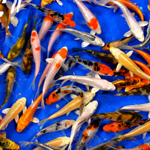 Premium Grade Koi have a much nicer selection of colors and varieties than Standard Grade, with a price that remains reasonable. Some of the more popular and rare varieties (Kumonryu, Kikokuryu, Goshiki, Goromo, etc.) may be more prevalent in Premium Grade than Standard Grade.